Metered PDU - Fil-Nippon Technology Supply, Inc.
Metered PDU There are 4 products. The NRGence PE5324L eco PDUs are low profile intelligent PDUs that contain 24 AC outlets and are available in various IEC or NEMA socket configurations. The low profile series has a smaller input region on the PDU to provide more installation space for data centers. 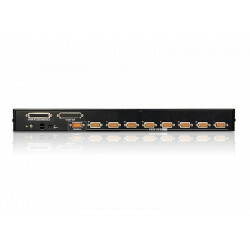 The NRGence PE5340SL eco PDUs are low profile intelligent PDUs that contain 40 AC outlets and are available in various IEC or NEMA socket configurations. The low profile series has a smaller input region on the PDU to provide more installation space for data centers. The PE5108 eco PDUs are intelligent PDUs that contain 8 AC outlets and are available in various IEC or NEMA socket configurations. They provide secure, centralized, intelligent, power management (power on, off, cycle) of data center IT equipment, as well as the ability to monitor the center's health environment via sensors*.